Line from this film: "Selecting the proper television is of utmost importance, and there are many models from which to choose"
This 2007 short harkens back to the 1940’s, when Goofy (one of Walt Disney’s most beloved animated characters) appeared in a series of “How To” films, from 1942’s How to Play Baseball (my personal favorite) to How to Ride a Horse in 1950. In most of these outings, Goofy would do his best (and often fail) to master the subject at hand, while a narrator, ignoring the on-screen anarchy, offered sound advice on each topic. 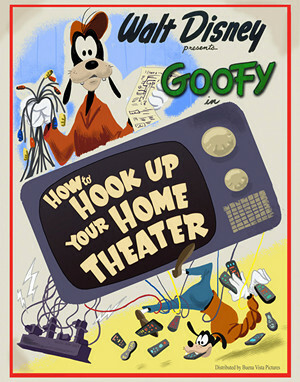 Intended as a humorous spin on the documentary shorts of the day, when movies tried to teach us everything from proper etiquette to how to find a job, the Goofy “How-to” series was popular with audiences, and 2007’s How to Hook Up Your Home Theater recaptures the magic of those older cartoons while, at the same time, updating the subject matter for the modern viewer. Narrated by Corey Burton (trying to sound like John McLeish, the voice behind many of the classic “How To” shorts), How to Hook Up Your Home Theater has our hero first purchasing, then attempting to set up a brand new home theater, which he hopes to finish before the big football game. Occasionally overwhelmed by the project (especially when it comes to mapping out the surround sound), Goofy somehow gets the job done (though, to be honest, the resulting system doesn’t look anything like it did in the brochure). Seeing as he had trouble learning our national pastime in How to Play Baseball, it’s no surprise that Goofy is in way over his head in How To Hook Up Your Home Theater, starting with picking out the proper television (ignoring the narrator’s advice that “A conservatively-sized unit is the most prudent selection”, Goofy is drawn to a behemoth model that most likely won’t even fit in his front room). The hook-up itself doesn’t go any better (Goofy has to cut a hole in the wall to plug the necessary wires into the back of the TV), and things get downright ugly when he reaches for the remote, only to find he now has about a dozen to choose from, with no idea which one turns the damn television on! Still, despite his hardships, Goofy does manage to see the big game, though the promise that his new system will “put him in the middle of the action” is more accurate than he imagined. Whether viewed as an homage to the studio’s early days or a straight-up comedy short, How to Hook Up Your Home Theater is an absolute hoot.